tortilla chips recipe | nachos chips recipe | mexican chips recipe with a detailed photo and video recipe. a simple and easy snack chips recipe made with the combination maize flour and wheat flour. 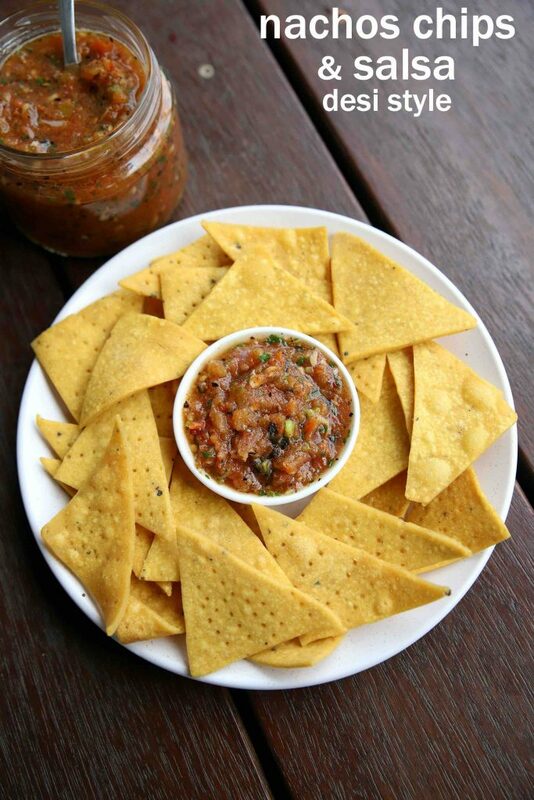 it is primarily used in mexican cuisine and shared as cheesy nachos or perhaps with tomato salsa dip. it is popularly also known as triangular chips, because of its triangular shape, but can be shaped to any desired shape. 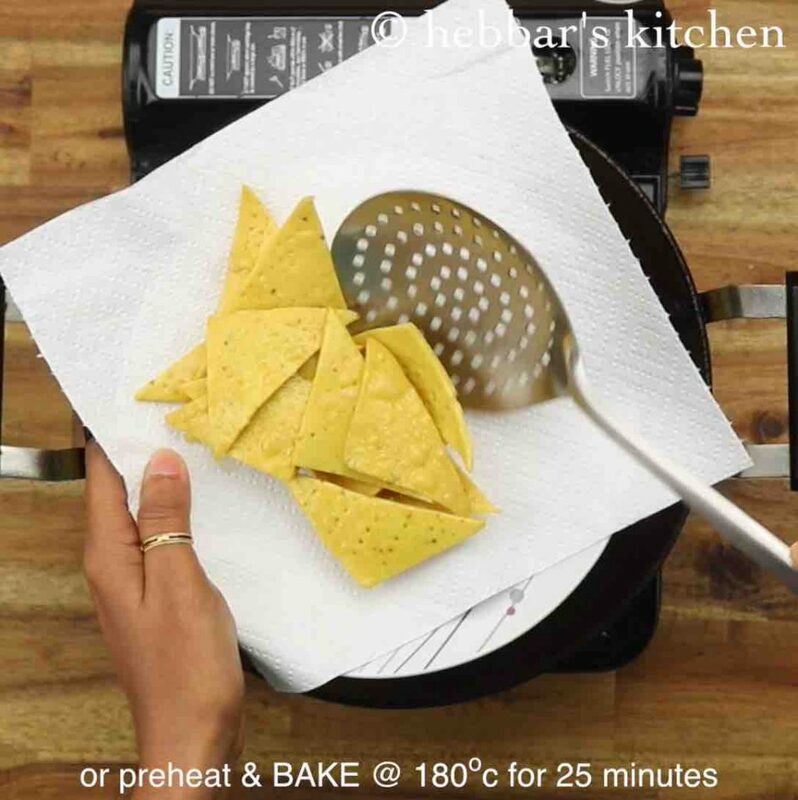 tortilla chips recipe | nachos chips recipe | mexican chips recipe with step by step photo and video recipe. there are several ways and forms of chips recipes within indian cuisine and with the overseas cuisines. generally, these chips are made with thinly cut vegetables dipped in spice batter and deep fried. but nachos chips or tortilla chips is unique and made with corn flour. in the mexican cuisine, nachos chips or tortilla chips play an important role and is shared as both mains or complimentary meal. 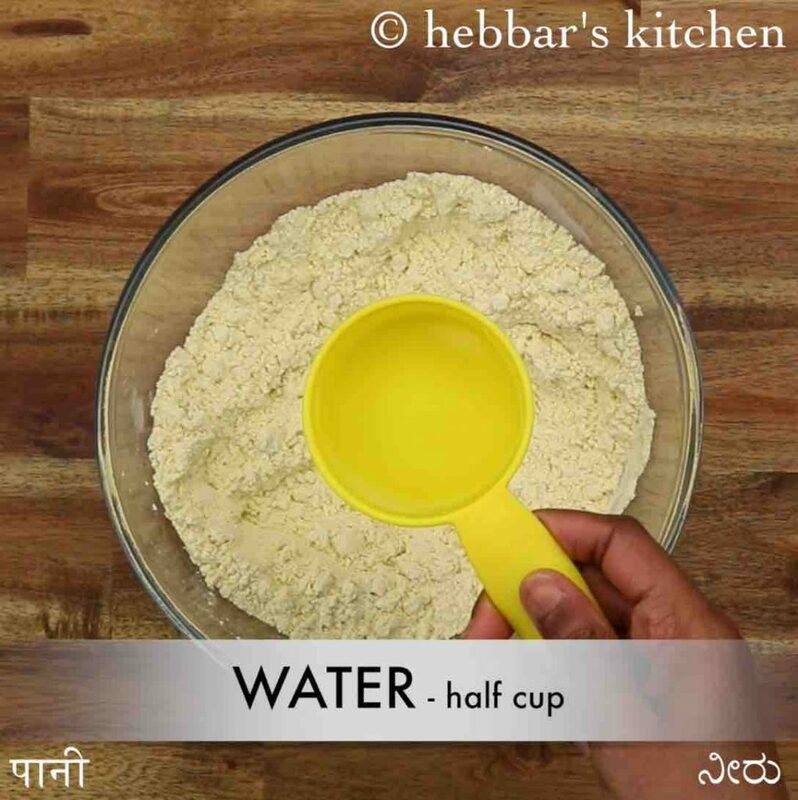 as a simple snack, it can be eaten as it is but tastes good with schezwan sauce or salsa dips recipe. but the main use of this chips in the cheesy nachos recipe which is mainly made with sour cream, mixed veggies, salsa sauce and kidney beans. it is topped with melted cheese and then followed by baking it in an oven. this is can be eaten as a snack dish or perhaps as a complete meal. my personal preference is to have it as cheesy nachos meal but makes a good snack with plain salsa dip too. furthermore, some important and critical tips and suggestions while preparing tortilla chips recipe or nachos chips recipe. 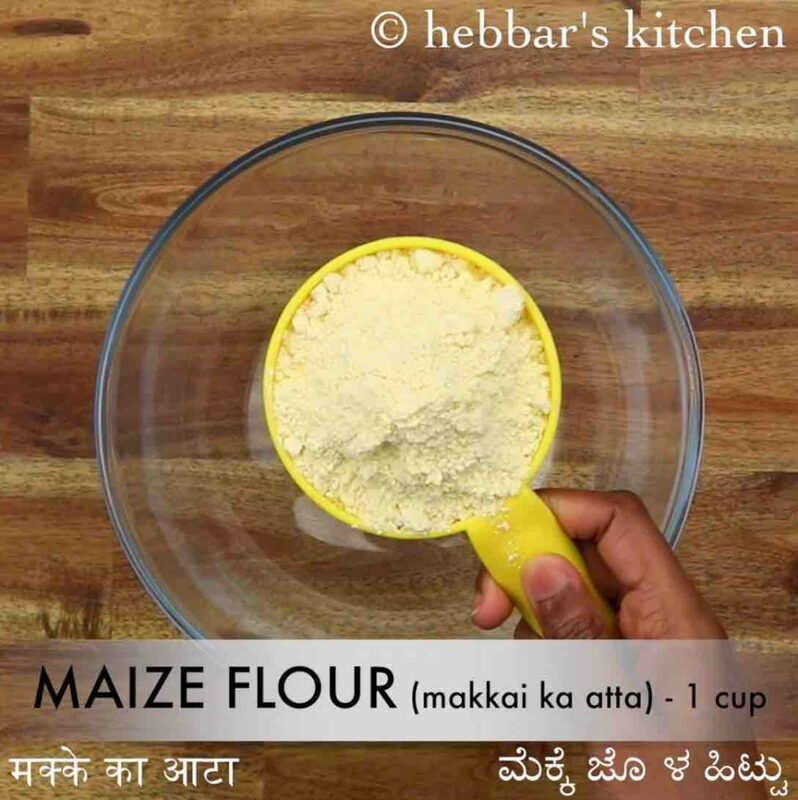 firstly, the chips can be entirely made with maize flour and can be done with yellow or white corn flour. i have made this chips with maize flour and wheat flour and thus making it a healthy and crisp snack. secondly, the chips have to be deep fried in an optimal temperature to make crisp and at the same time perfectly cook. 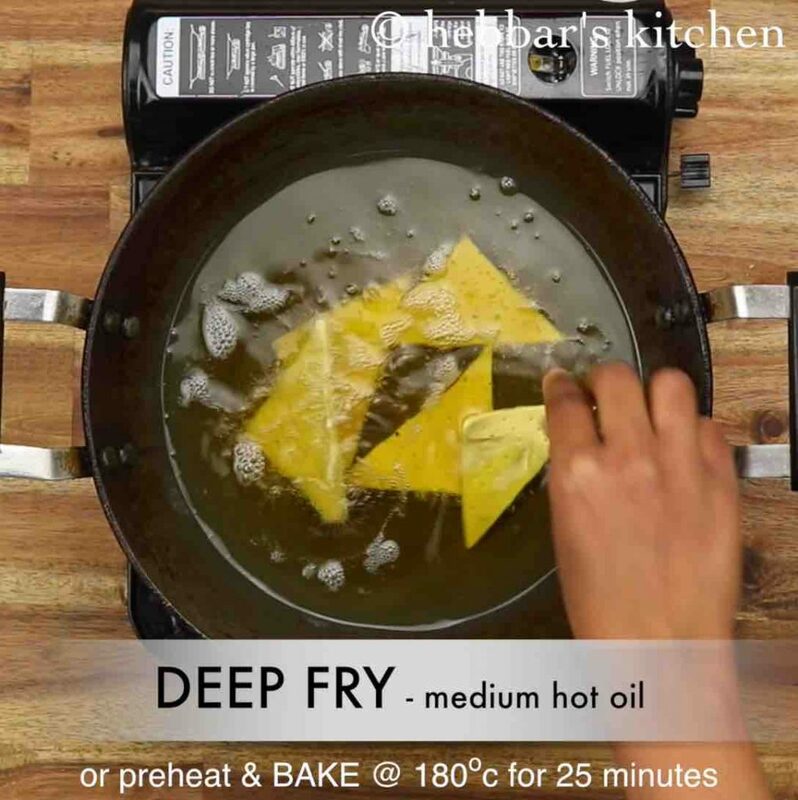 to achieve this, you can heat the oil in a medium heat at the beginning and once switch to low flame while deep frying. lastly, store these chips in an airtight container for longer shelf life. 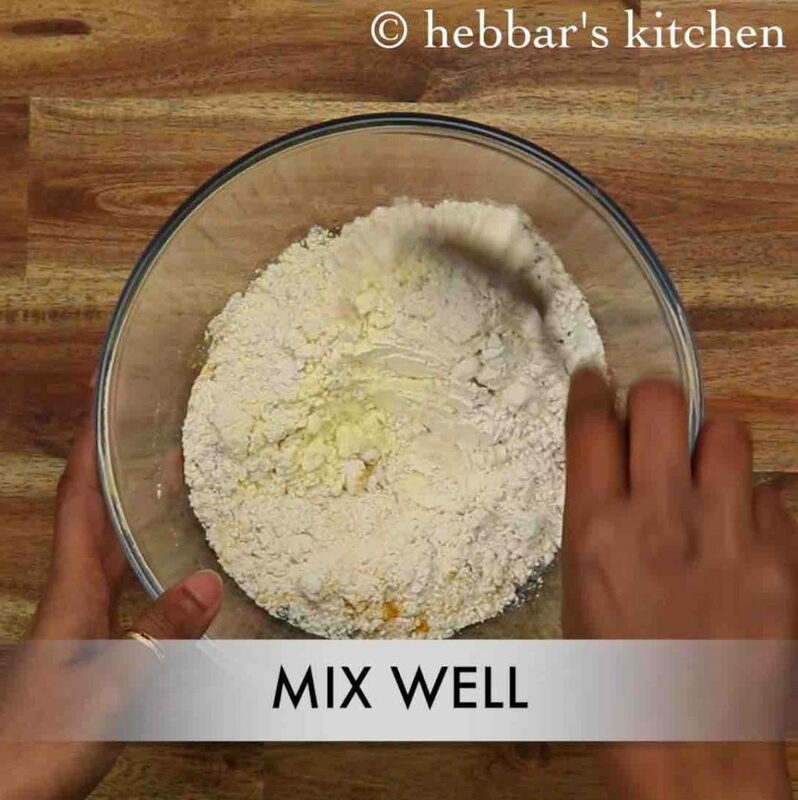 firstly, in a large mixing bowl take 1 cup maize flour and ½ cup wheat flour. 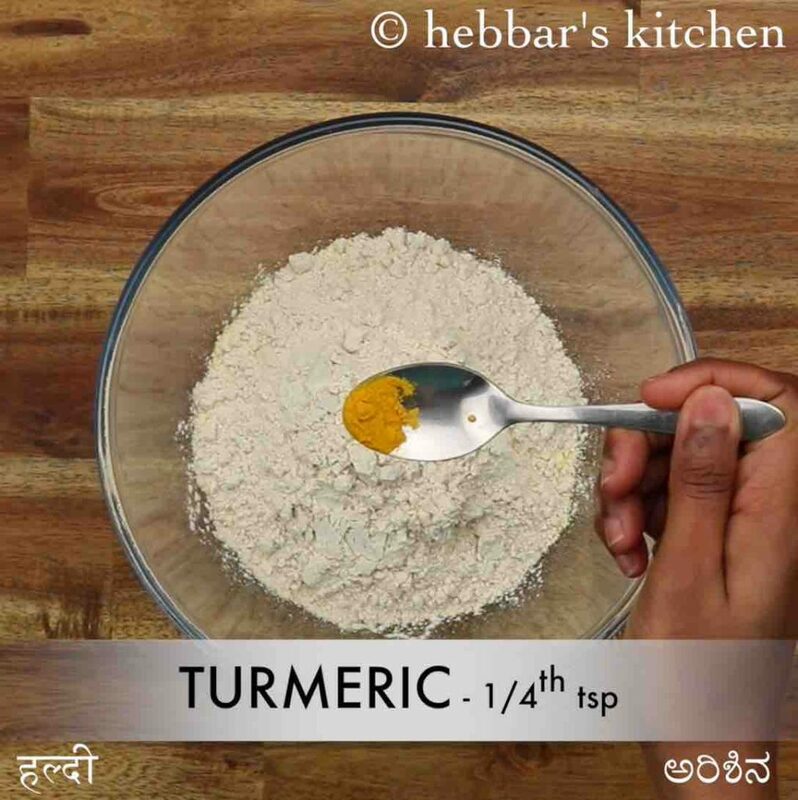 also add ¼ tsp turmeric, ½ tsp pepper, ½ tsp salt and 2 tsp oil. 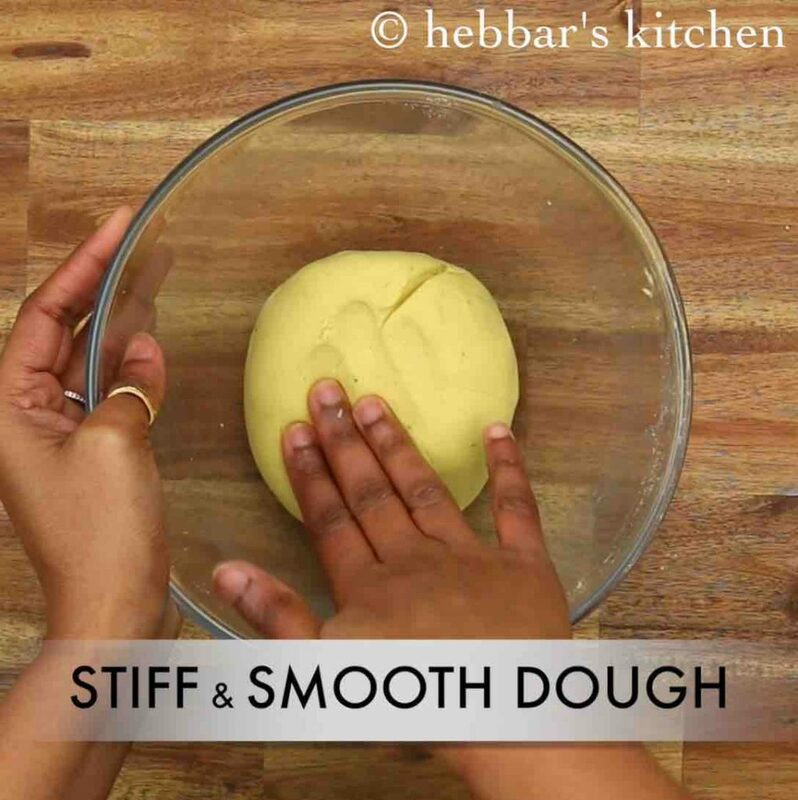 now add ½ cup water and start to knead the dough. knead to stiff and smooth dough adding water as required. 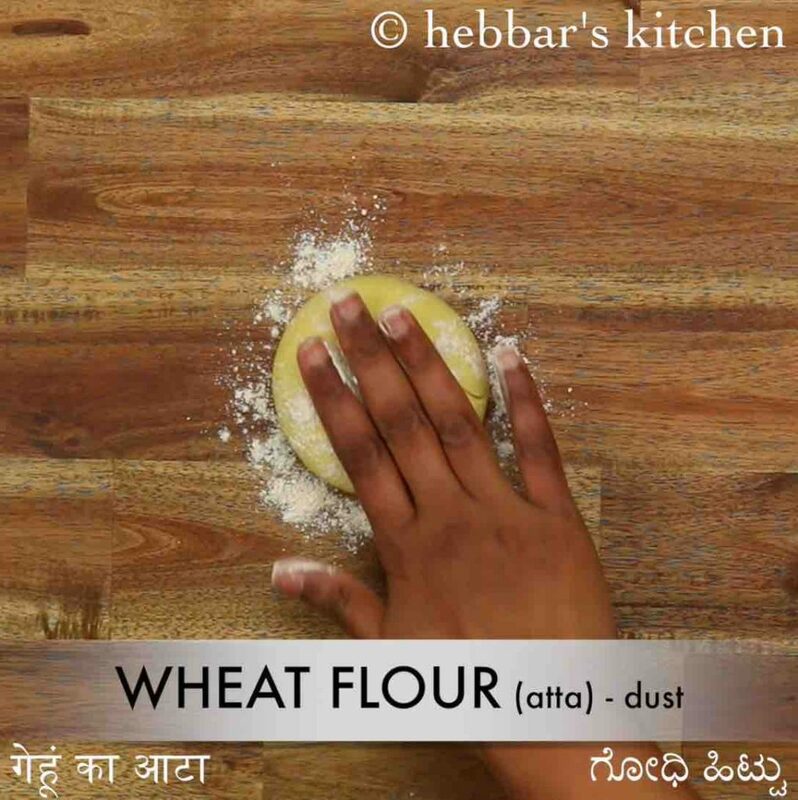 pinch a ball sized dough, and dust with wheat flour. 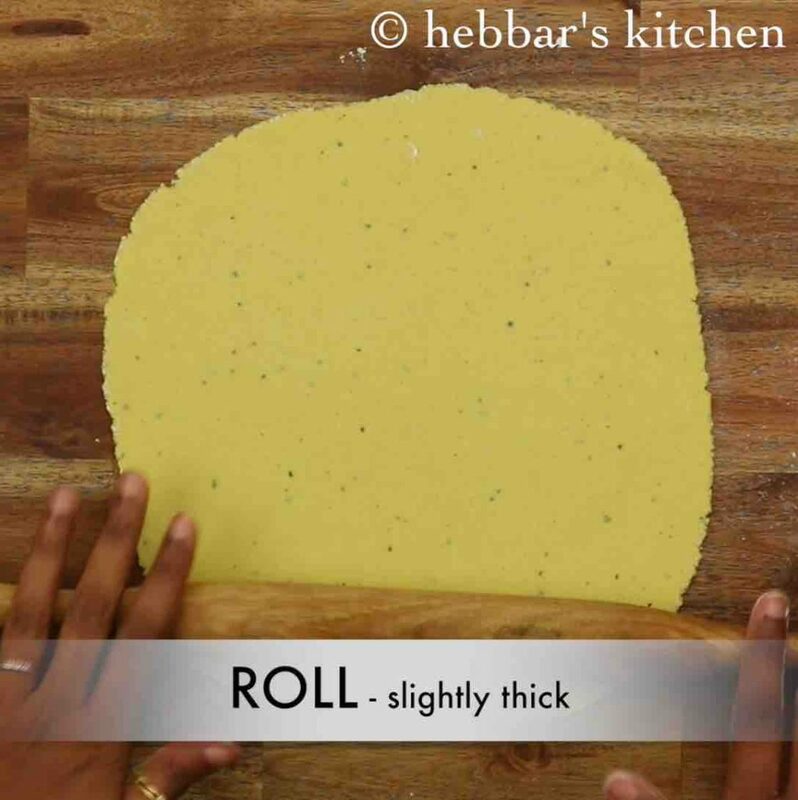 roll slightly thick, dusting wheat flour as required. 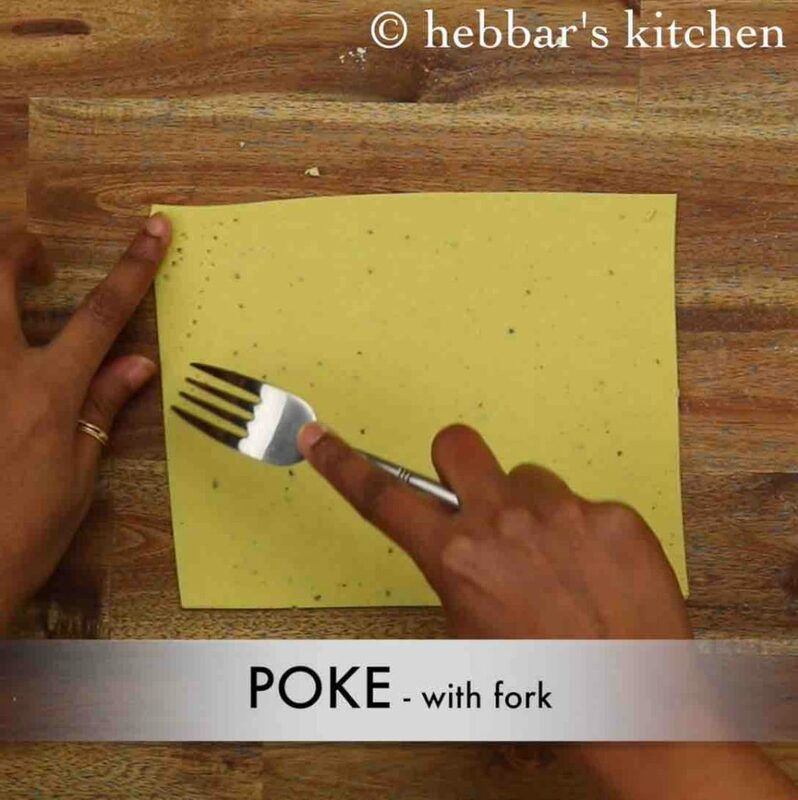 prick the roll with a fork, preventing from puffing up while frying. 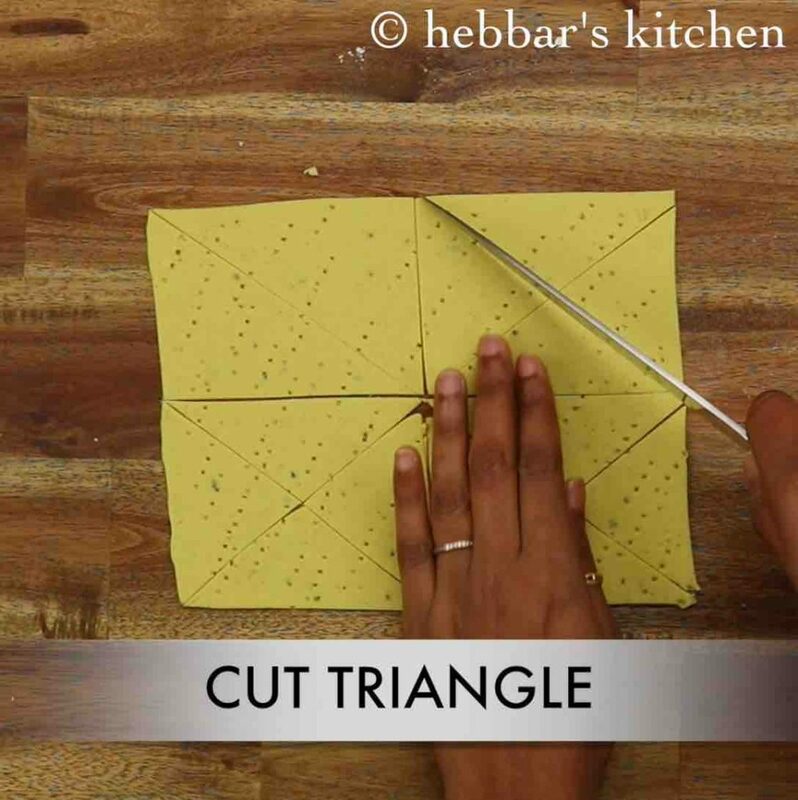 trim the sides and cut into triangle pieces. now drop the triangle chips into the medium hot oil. or bake in preheated oven at 180 degree celcius for 25 minutes. fry on low to medium flame stirring in between. 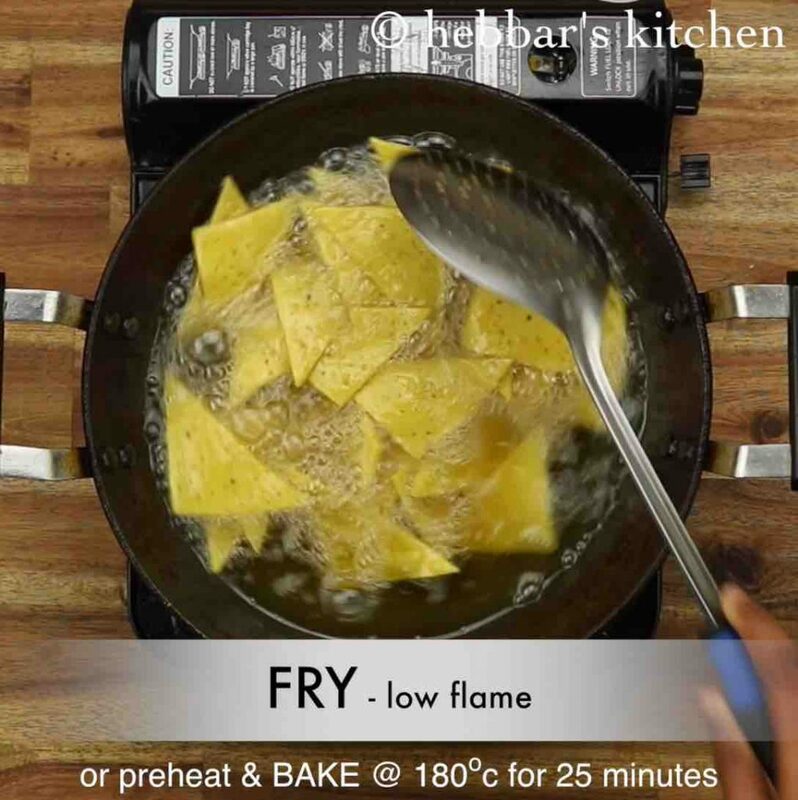 fry on low flame until the nachos chips turn crisp and golden brown for 10 minutes. drain off the chips over kitchen paper. 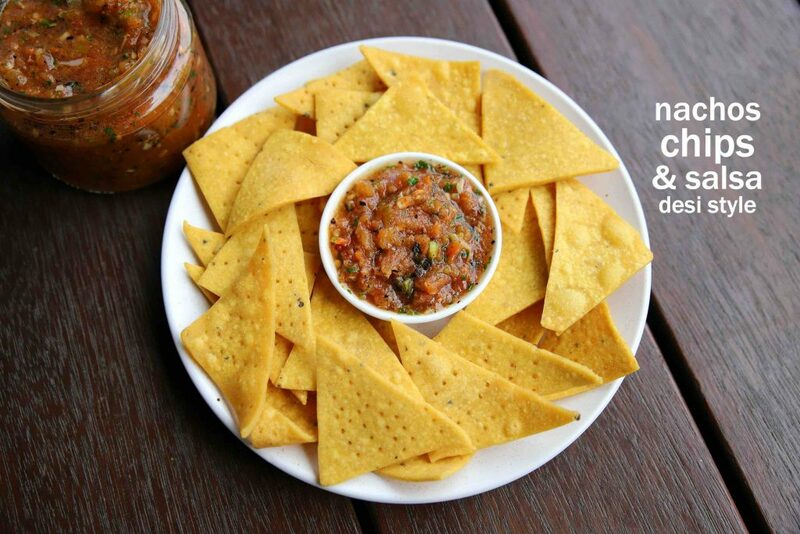 finally, enjoy nachos chips with roasted tomato salsa or store it for a month in an airtight container. fry on low flame until the nachos chips turn crisp and golden brown for 10 minutes. drain off the chips over kitchen paper. 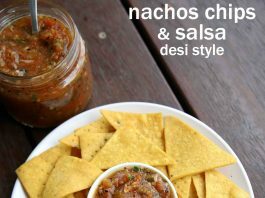 finally, enjoy tortilla chips / nachos chips with roasted tomato salsa or store it for a month in an airtight container. firstly, knead the dough well, else it will be difficult to roll as it breaks. also, fry on low to medium flame, else the nachos chips will not turn crisp. additionally, use tomato paste to the dough to prepare tangy chips. finally, tortilla chips / nachos chips recipe tastes great when fried rather than baked.